The Emergency First Aid at Work (EFAW) Training Course aims to provide delegates with basic theoretical and practical skills in current First Aid. It is designed for employers of small to medium sized companies who wish to provide the highest standard of first aid care to employees, contractors and the public. 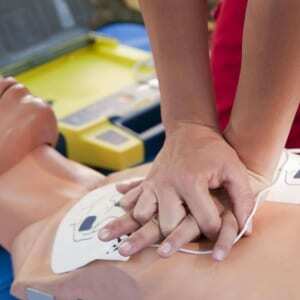 The course also includes the safe use of AED’s (Automated External Defibrillators). This 1 day Emergency First Aid at Work (EFAW) course is full accredited and designed for low risk environments such as the office, low hazard manufacturing / warehousing, health & social care and small to medium sized organisations where there is no requirement for a First Aid at Work (FAW) trained person. Under the new regulations this course has changed from a Level 2 QCF and becomes Ofqual regulated (RQF) Level 3 accredited. Ashtree offer the Ofqual accrediting system for EFAW courses, this replaces the HSE accreditation with the new Level 3 (RQF) Award in Emergency First Aid at Work certificated through our AO (Awarding Organisation). The syllabus & practical Assessment method remain the same but an end of course test has been included. Call us if you need any clarification as to which course you need. Please note: We also provide the Emergency First Aid course which is exactly the same as the EFAW but is not accredited, we supply this course as an alternative for organisations that wish to have qualified “First Aiders” on site but in their opinion do not need them to be accredited. The HSE recognise this training providing a suitable “Needs Assessment” has been undertaken by the organisation, we can help you with this if you think this course is more suitable. Successful completion of the Emergency First Aid at Work course qualifies the certificate holder to act as a “First Aider” in the workplace. Any employees over the age of 16 can attend who wish to learn more about First Aid and take on the company responsibility to become a “First Aider”. The accredited certificate is valid for 3 years and is issued by our Awarding Organisation (AO). The Health & Safety Executive strongly recommend the delegate to attend a 1/2 day refresher course on an annual basis although this is not mandatory. Group price £320.00 + £5.00 / person for accreditation + Vat for 12 delegates max. Group price £300.00 + £5.00 / person for accreditation + Vat for 6 or less delegates. There are no pre-requisites for this course although the delegates need to be capable of some practical sessions undertaken on the floor. A suitably sized room will be required for the duration of the course to allow for various practical sessions, it is a requirement by the HSE that all delegates are physically capable of getting down on the floor to undertake practical sessions. We recommend the delegates wear suitable / comfortable clothing for this session.